Some of Maui’s popular chefs are sharing their star status and knowledge with Maui high school students in an effort to inspire a future wave of culinary talent on the Valley Isle. 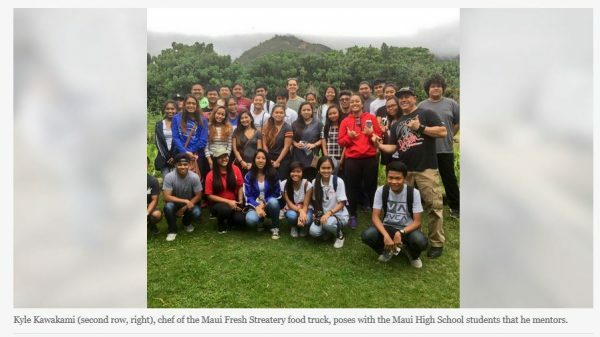 Lanai City-raised chef Adam Tabura, who won the Food Network’s “Great Food Truck Race,” was recently at King Kekaulike High School, where he mentored 160 students over two days. “We talk about them mostly, what they want to do, but hopefully I’ve inspired them,” Tabura said, who taught the students how to make Hollandaise sauce last month while he was on the island for business and promoting his new products and cookbook. Tabura added that even if the students don’t want to be chefs, he is there to give guidance. Tabura is part of the Hawaii Culinary Education Foundation’s High School Chef Mentoring program. On Maui, he is joined by three other chefs mentoring at high schools: Ryan Luckey of Leilani’s on the Beach, at Lahainaluna High; Kyle Kawakami of Maui Fresh Streatery food truck, at Maui High; and Tylun Pang of Fairmont Kea Lani, Maui, at Baldwin High. There are 43 chefs and 38 high schools statewide participating in the program. “Our goal is to inspire the next generation of culinary professionals and to provide students with insight into the profession,” said Hayley Matson-Mathes, HCEF’s executive director. The nonprofit organization gives Hawaii’s culinary students and professionals access to cutting-edge knowledge and techniques through programs featuring visiting chefs, educational opportunities and special fundraising events, according to its website. Matson-Mathes said that chef mentors also provide overviews of the restaurant business, employment challenges and qualifications necessary to become a chef. “In the process, working chefs gain inspiration from the culinary students and reconnect to why they entered the profession. The culinary teachers gain a chef who is their mentor, too,” Matson-Mathes said. That’s true for chef instructor Cathy Feiteira at King Kekaulike, who said that Tabura assisted her during the Hollandaise sauce project. Kawakami, a 1989 Maui High graduate, is back at his alma mater and has been working with culinary students there for three years. Kawakami is a former culinary arts instructor at University of Hawaii Maui College, where he was active in recruiting Maui County students for the culinary arts program. 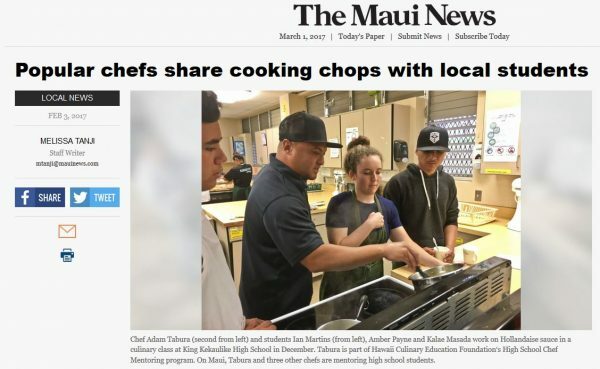 He also developed and implemented, with state funding, a Maui County high school culinary competition called “Into the Fire,” which ran for three years and awarded students scholarships to the culinary program at UH-Maui College. Tabura is just beginning his relationship with King Kekaulike and will be back at the school in the spring, while Kawakami continues to grow his relationship with Maui High. In addition to conducting hands-on demonstrations such as pasta-making, Kawakami has taken students on visits to farms such as Kumu Farms in Waikapu so that the students can see where food comes from. He is planning to take the students to a seafood purveyor to view the processing and butchering of whole fish. Matson-Mathes added that the volunteer mentor chefs help with flavor development, knife skills, menu concepts and recipe development, and conduct culinary and farm tours and visits to local restaurants and hotels. Tabura, a 1994 graduate of Lahainaluna, said that he would like to go back there to mentor students in the future. Currently, Tabura, who now lives on Oahu, is selling his Spice Rack Hawaii spices on Maui. His sorbet line, Pacific Sorbet, will soon be available on Maui, Tabura said. His cookbook, “A Filipino Kitchen,” is available on his website, www.adamtabura.com, and at Barnes & Noble.